Looking for a great way to accent your outdoor living space? Check out our outdoor linear fireplaces! Choose from a selection of brands such as Napoleon, Majestic, and more. These fireplaces have features including Reflective Black Glass panels, driftwood logs, natural stone and glass firebeds, LED lighting and more to enhance your outdoor decor. The fireplaces come in various lengths to fit any backyard or outdoor area. 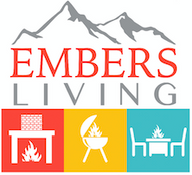 So start shopping with Embers Living today to spice up your home with a new fireplace.